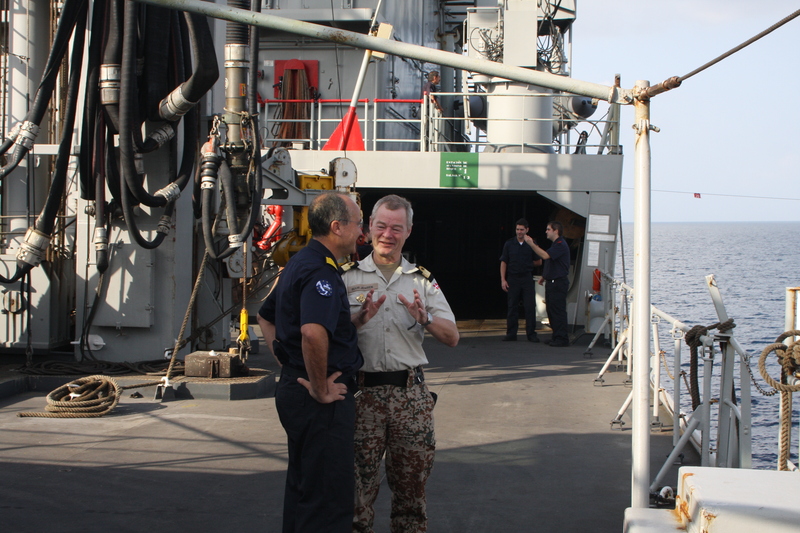 Commodore Aage Buur Jensen Danish Royal Navy, Commander Combined Task Force 151 (counter piracy) met with his European Union naval colleague, Captain Jorge Manso, Commander, Task Force 465, onboard the Spanishflagship SPS PATINO Jan.19. 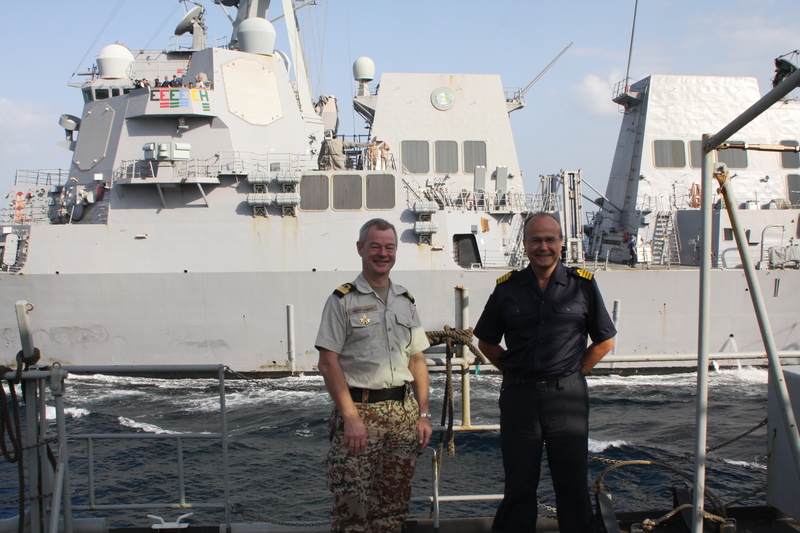 The opportunity arose to meet face to face while the USS HALSEY, the flagship of the Danish-led Task Force, was conducting a refueling evolution with SPS PATINO. Meeting at sea is not a simple task when considering the size ofthe operations area; two and a half million square miles. The two task force commanders discussed their common counter-piracy mission off the Horn of Africa. Good personal relationships and co-ordination are vital in order to assure that there is optimal resource allocation and enduring communication, even across two different task groups. USS HALSEY has recently assumed the role of flagship to Commodore Aage Buur Jensen, Royal Danish Navy and his multi-national CTF 151 command staff on Jan, 13. CTF 151 transferred command from the Pakistani Navy who was previously embarked with the USS KIDD (DDG 100). CTF 151 is one of three Task Forces assigned to Combined Maritime Forces. Established in February 2002 the Task Force’s key mission is to conduct counter-piracy operations in the Red Sea, Gulf of Aden, Somali Basin , Arabian Sea and Indian Ocean . It protects and defends the legitimate use of the ocean by fisherman and merchants and stands ready to assist any mariner in distress.